I’m Chloe Cusson and I’m about to start my Senior year at FGCU. I’m in a Sorority and am the Secretary for the Panhellenic Executive Board. I am originally from New Hampshire, but I have been living in Fort Myers for about 10 years. I am a total race junkie and have completed many RunDisney events, Spartan Races, and Tough Mudders. When I’m not traveling for a race or at the gym I’m either working at Lovers Key Resort or hanging out with my mom watching Greys Anatomy. Free time isn’t something I’ve had a whole lot of the past few months so I’m glad I’ve made such good friends at the gym. I’m excited to keep improving and to keep making memories at CF Fireball! What is your favorite WOD? Any WOD that includes Running. What is your least favorite WOD? Any WOD that has Rowing or Burpees. What is your favorite lift? What is your least favorite lift? What did you do before CrossFit? 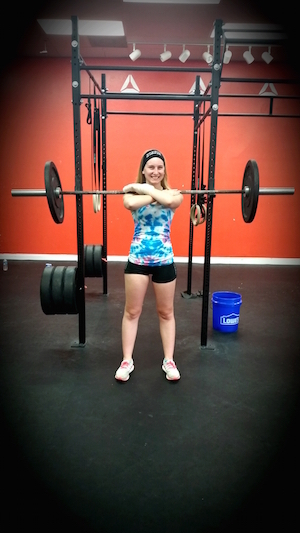 What did you think after your first CrossFit experience? How does it compare to now? My first CrossFit experience was at Fireball in August and I thought ehh I’ll just do it to get in shape for my race but I’ll never get that into it. Now I couldn’t imagine working out anywhere else. What special memories or achievements have you had since you have been at CF Fireball? I saw a picture on Instagram a little while ago from when I was still new to CrossFit and I was using a training bar for thrusters. To be able to look back and see how far I’ve come is an awesome feeling. To have such support from the other members and coaches is something I love about Fireball. What advice would you give to a newcomer joining CrossFit Fireball? Everyone starts somewhere, so don’t get discouraged just do the best you can and eventually the hard work will pay off. How did you become involved with CrossFit? I wanted to get in shape for a Spartan race I was doing. What is the biggest change you see in yourself since starting CrossFit? I no longer sandbag the workouts. I push myself and I don’t automatically assume I can’t do something. What are your hobbies outside of CrossFit? What is your profession? Outside of Crossfit I love to run and do obstacle races. At the moment I’m a student at FGCU studying Resort and Hospitality Management.